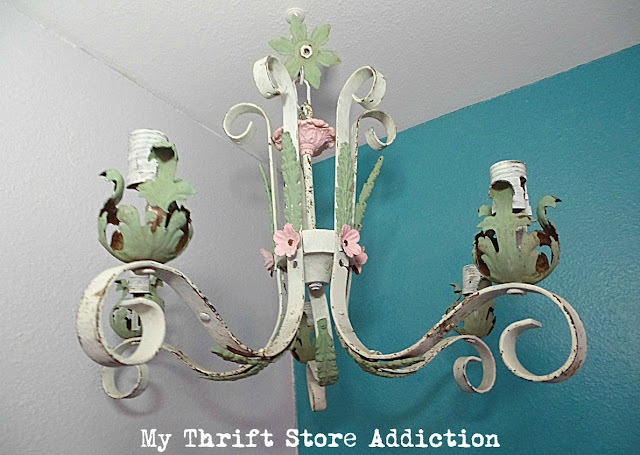 You may remember this shabby chandy I scored at Vintage Market Days just before the holidays last year. It was pretty fabulous already, but I knew I wanted to tweak it to make it more my own. As is often the case, I hung it up and lived with it for a bit before deciding. This upcycle has progressed in a series of steps, which is one reason I haven't shared it before now. After the holidays, I brightened it with some white chalk paint. I covered the green details, but stayed with the distressed look. ...and so I played dress-up again! 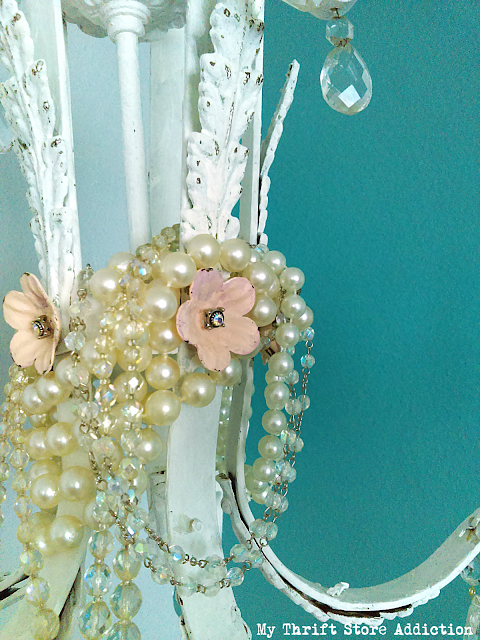 The blush colored flowers were bedazzled with rhinestones from a broken bracelet. 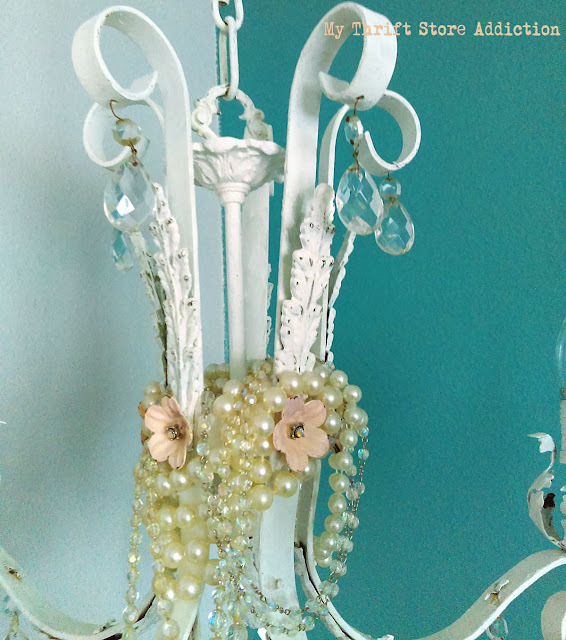 Vintage beads and baubles from my collection were draped over, around, and under to accessorize my chandy. 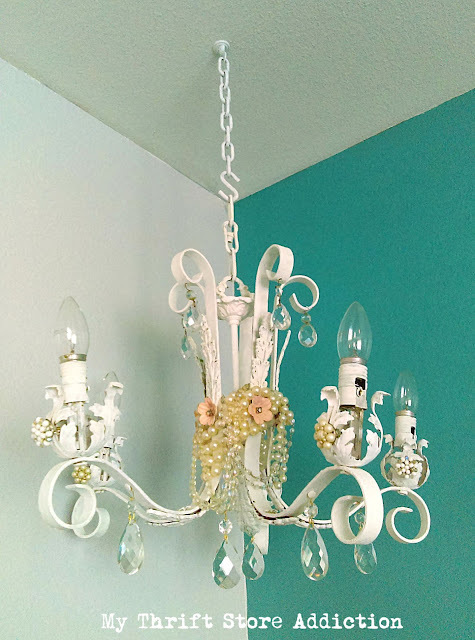 By this time, I'd found more chandelier crystals to add to the bottom section of the chandy. 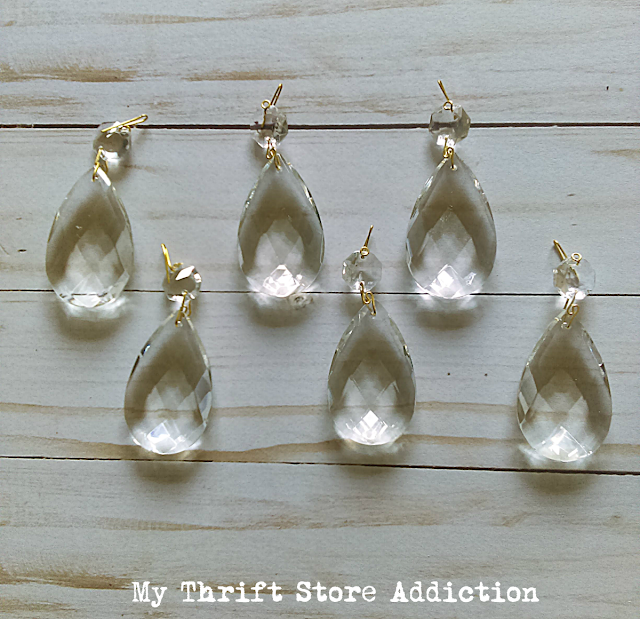 Last but not least, I clipped on some vintage earrings. I'm really pleased with the finished results. 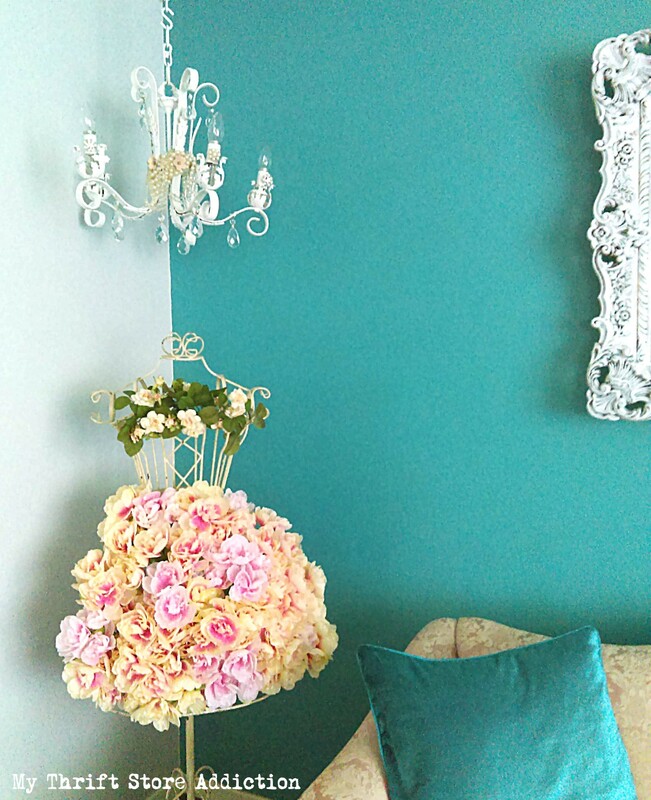 It hangs in the corner over my dress form, Juliet and and next to my vintage settee, Rosie. I've been slowly transitioning from summer to fall but it's likely Juliet will be decked out in her blooming floral dress until the holidays. Lovely, and this is why we all hang onto our broken jewelry, earrings with mates etc. One year for Christmas, I hung clear glass ornaments on each of my five chandelier arms, plus one on the center ring. Then above each ornament, I clipped on a small white dove ornament. It was a simple update. 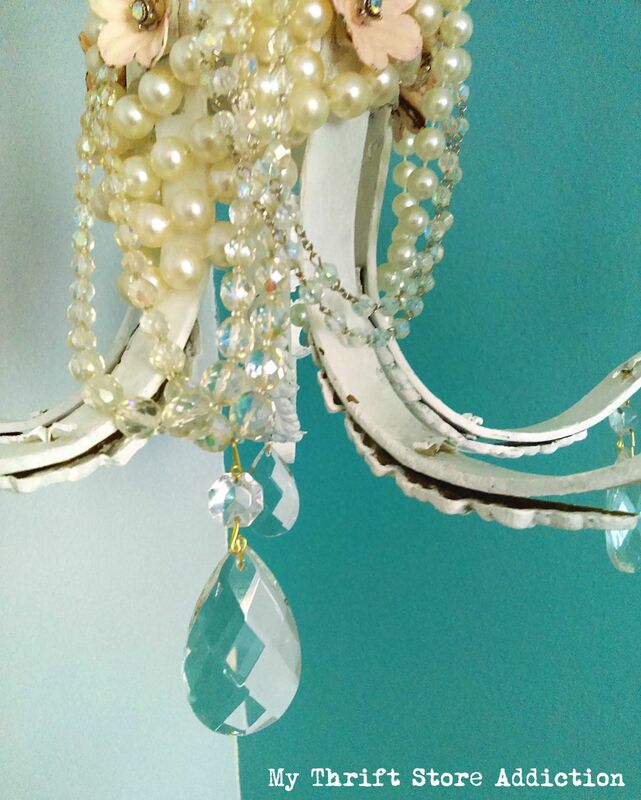 Love your chandelier dress up! 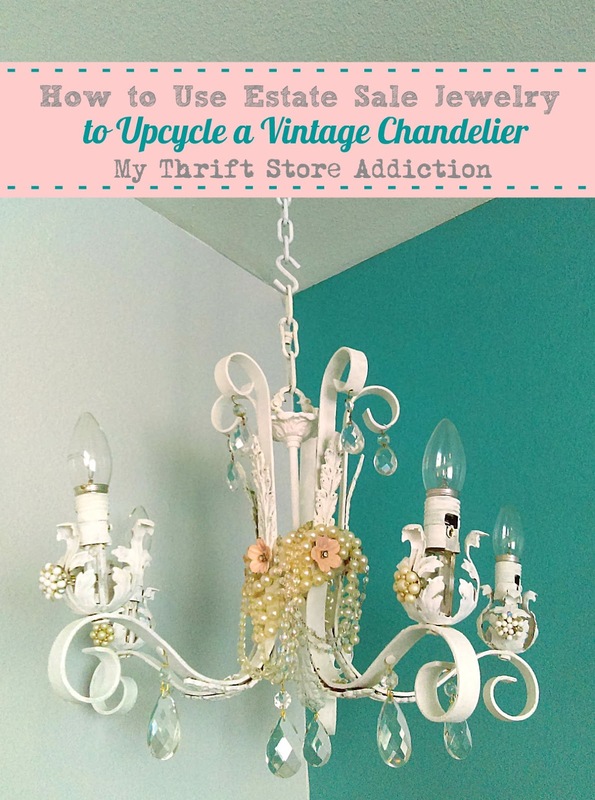 Great use for broken vintage jewelry. Unique idea! I also love the floral dressed figure! I got a chandelier (when the yard sale was fill a bag for a buck) and I thot I was going to paint it with hammered metal. Now I'm not so sure! Love the effect of yours! 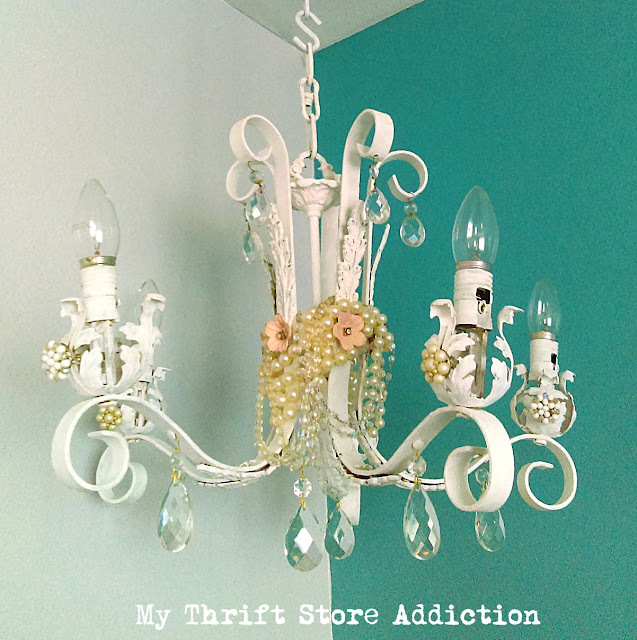 What a fun idea and a great way to showcase jewelry finds! Such a fun idea!! Love that chandelier!! !